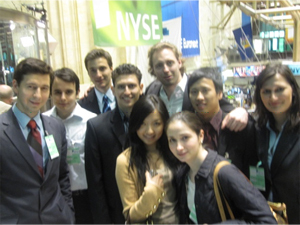 Baruch College Visits the New York Stock Exchange By Daniel Kamelhar - The Eve Fenton Love-All Foundation, Inc.
On Thursday, May 13, 2010, a group of students from Baruch College & Magen David High School visited the New York Stock Exchange for a Financial Literacy event. This event was run through the Eve Fenton Love-All Foundation and was coordinated by Mr. Daniel Kamelhar. This program was designed to show students that there is more to the stock market than what they see on TV or read in the paper. They learned how a stock trade gets routed from an individual computer to the NYSE. They learned about the difference between the NYSE and the NASDAQ. This trip occurred just one week after the Dow Jones had an intraday drop of 998 points. We discussed how the NYSE had to handle billions of shares being traded in a matter of minutes. 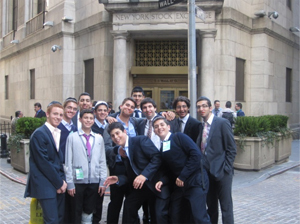 The students learned that stock trading also occurs in many different mini exchanges throughout the country. This was partially what caused the downward spiral on May 6, 2010 and had some stocks trade as low as a penny. There was also a discussion about how to keep stock prices fairly traded. They were spoken to by Mr. Bill Dobrow, who works with Ameriprise, about investing. He made a presentation about understanding stock pricing, and tried to explain to students that trading today is much different than trading even fifteen years ago. He took questions on individual stocks such as Apple and Proctor & Gamble. He showed both entry price points & exit points for these stocks. They learned about specialists who are people that are assigned to trading specific stocks each day and ultimately are responsible for both fair pricing and order priorities. Our students truly saw a different view of what stock trading is all about. They saw and heard how this complex system that handles billions of shares a day from all over the world works. After all the speeches and learning the students were finally able to actually observe the floor of the NYSE during trading hours. The group was able to get on the floor at 3:30 PM to experience the hectic last half of floor trading and see the famous closing bell that is heard and seen throughout the world at 4:00 PM daily. It was truly a day to remember.